DNA can be synthesized chemically for a number of purposes. DNA and RNA are at their essence chemical structures, and as such complex chemical reactions can be used to synthesize them. There are enzymatic ways to amplify DNA, notably PCR, while DNA sequences can be chemically synthesized by a process known as oligosynthesis. Oligosynthesis can be used to make artificial genes, which allows scientists to design and synthesis novel gene products, without relying a template of a gene found in nature. phosphoramidite: Any of a class of organic compounds formally derived from a phosphite by replacing a >P-O-R with a >P-N<R2 group; used in the synthesis of nucleic acids, etc. HPLC: High-performance liquid chromatography (sometimes referred to as high-pressure liquid chromatography), HPLC, is a chromatographic technique used to separate a mixture of compounds in analytical chemistry and biochemistry with the purpose of identifying, quantifying and purifying the individual components of the mixture. To understand bacterial genetics, the underlying genetic material (i.e. DNA) must be understood. DNA must be synthesized to study genes, the sequence of genomes, and many other studies. This occurs in two fashions, by polymerase chain reaction (PCR) which is enzymatic and chemical synthesis. PCR is covered in another atom. Here we will focus on chemical synthesis of DNA, which is also known as oligonucleotide synthesis. Oligonucleotide synthesis is the chemical synthesis of relatively short fragments of nucleic acids, both DNA and RNA with a defined chemical structure (sequence). The technique is extremely useful in current laboratory practice because it provides a rapid and inexpensive access to custom-made oligonucleotides of the desired sequence. Whereas enzymes synthesize DNA and RNA in a 5′ to 3′ direction, chemical oligonucleotide synthesis is carried out in the opposite, 3′ to 5′ direction. Oligosynthesis. : The complex chemical reactions that are needed to couple one nucleotide to another are outlined here. Currently, the process is implemented as solid -phase synthesis using phosphoramidite method and phosphoramidite building blocks derived from protected 2′-deoxynucleosides (dA, dC, dG, and T), ribonucleosides (A, C, G, and U), or chemically modified nucleosides, e.g. LNA. To obtain the desired oligonucleotide, the building blocks are sequentially coupled to the growing oligonucleotide chain in the order required by the sequence of the product. The process has been fully automated since the late 1970’s. Upon the completion of the chain assembly, the product is released from the solid phase to solution, deprotected, and collected. The occurrence of side reactions sets practical limits for the length of synthetic oligonucleotides (up to about 200 nucleotide residues) because the number of errors accumulates with the length of the oligonucleotide being synthesized. Products are often isolated by HPLC to obtain the desired oligonucleotides in high purity. Typically, synthetic oligonucleotides are single-stranded DNA or RNA molecules around 15–25 bases in length. Oligonucleotides find a variety of applications in molecular biology and medicine. They are most commonly used as antisense oligonucleotides, small interfering RNA, primers for DNA sequencing and amplification, probes for detecting complementary DNA or RNA via molecular hybridization, tools for the targeted introduction of mutations and restriction sites, and for the synthesis of artificial genes. A further application of oligosynthesis is to make artificial genes. Artificial gene synthesis is the process of synthesizing a gene in vitro without the need for initial template DNA samples. 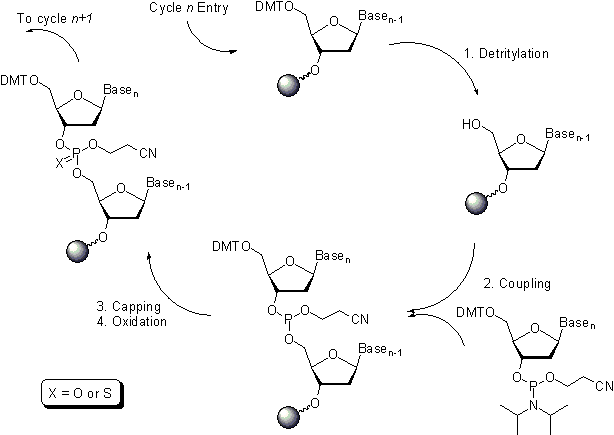 The main method is currently by oligonucleotide synthesis (also used for other applications) from digital genetic sequences and subsequent annealing of the resultant fragments. In contrast, natural DNA replication requires existing DNA templates for synthesizing new DNA.